Some residents of a Dallas apartment complex leaped from third-floor windows onto mattresses, and a woman dropped her baby to a bystander to escape the flames. DALLAS (AP) — Some residents of a Dallas apartment complex leaped from third-floor windows onto mattresses, and a woman dropped her baby to a bystander to escape the flames. Dallas Fire-Rescue spokesman Jason Evans says several residents and bystanders, assisted by police officers, went door-to-door to alert others to the fire Wednesday morning. Authorities say three people, including a firefighter, suffered minor injuries. KDFW-TV reports one woman dropped her infant to a man below as he held out his arms. 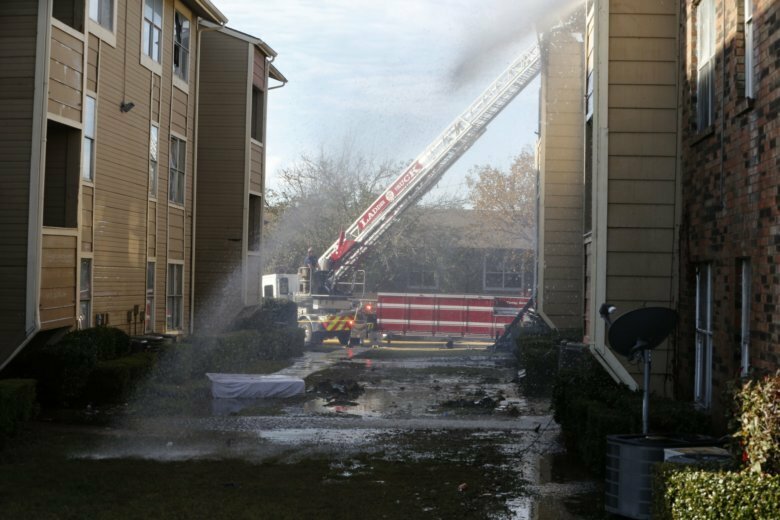 Other residents were seen jumping from third-story windows onto mattresses dragged from inside the east Dallas complex before firefighters arrived. The Dallas Morning News reports at least five residents jumped from the third level. Investigators are trying to determine what started the fire that destroyed about two dozen units.